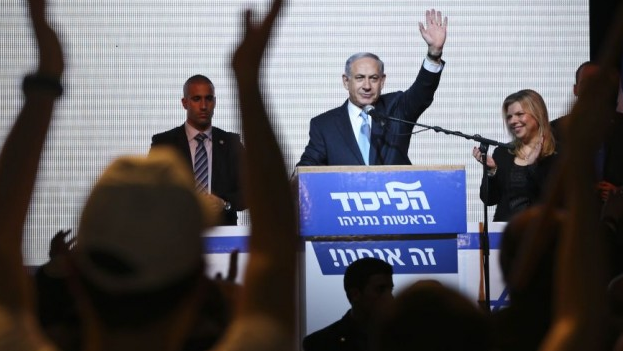 Netanyahu miraculously surges to 30 seats with 6-seat lead. Obama campaign backfires. UPDATED AT 8:30AM ISRAEL TIME: (Central Israel) — The Israeli media was completely wrong. The American pundits were wrong. 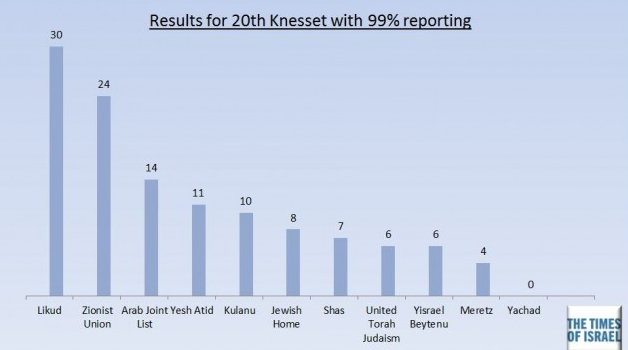 The Israeli newspaper polls were completely wrong. The TV network exit polls were completely wrong. This entry was posted in Geopolitics, Israel, News, Politics and tagged Netanyahu, Obama by Richard Barker. Bookmark the permalink. I was so pleased to see this! I went to bed last night praying for Bibi, Jerusalem and Israel. Let us not forget Jesus’ words “15”Therefore when you see the ABOMINATION OF DESOLATION which was spoken of through Daniel the prophet, standing in the holy place (let the reader understand), 16then those who are in Judea must flee to the mountains.17″Whoever is on the housetop must not go down to get the things out that are in his house. 18″Whoever is in the field must not turn back to get his cloak. 19″But woe to those who are pregnant and to those who are nursing babies in those days! 20″But pray that your flight will not be in the winter, or on a Sabbath. 21″For then there will be a great tribulation, such as has not occurred since the beginning of the world until now, nor ever will. 22″Unless those days had been cut short, no life would have been saved; but for the sake of the elect those days will be cut short.…” Matthew 24:15-22 The “Abomination of Desolation” is falling into place. Are we praying that these things don’t occur in the winter or on a Sabbath? WE CAN’T FORGET! Now, more than ever, we need to be doing this. Bibi’s win is actually a step closer to fulfilling prophecy because he refuses to divide Israel.